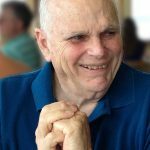 SALVO – George Studwell Mead, of Salvo, NC, passed peacefully at the age of 85 in Nags Head, North Carolina on January 4, 2019. George is survived by his devoted wife Gisele, son Bill, daughters Sally Anne and Elizabeth, brother John, and numerous nieces, nephews, grandchildren, and a (step) great grandchild. George was born on August 2, 1933, in Waccabuc, New York to John J.S. Mead and Anzle Butler Mead. He grew up with his two half siblings, Elizabeth and John, and enjoyed a close relationship throughout his youth with his aunts Emma and Francis. He served in the US Navy as a young man, subsequently attending college at Rensselaer Polytechnic Institute. George earned his masters degree in engineering at Massachusetts Institute of Technology, and built his career at Raytheon Company in Massachusetts. George married Gisele (Robichaud) in 1986, and in 2005 George and Gisele retired to North Carolina’s Outer Banks. George generously volunteered his time and talents, serving on the board of the Mead Memorial Chapel, in Waccabuc, New York, and on the North Carolina boards of the Salvo Volunteer Fire Department, Rodanthe-Waves-Salvo Civic Association, and the Graveyard of the Atlantic Museum. George loved adventure, discovery, and tinkering with mechanical objects, beginning with his design, build and use during boyhood of an underwater breathing apparatus constructed from household items. His abilities and interests evolved when he fixed radios while serving in the Navy. After he fathered children, he built bicycles for every member of his family out of salvaged bits and pieces. He fixed car engines using spare parts, and engineered clever set designs for community theatre productions. He enjoyed numerous sailing adventures and escapades with friends and family, and he had an abiding interest in aviation that included building model planes and ultralight aircraft. George loved to fly the ultralight airplanes he built, as well as training others in how to fly them. George will be remembered for his warmth and quick wit, his mischievous appreciation of puns and limericks, and his ability to find humor in any circumstance. A memorial service for George has not yet been scheduled, as his family would like to reflect on how best to celebrate his life. In the meantime, we wish to extend our heartfelt gratitude to the staff at Albemarle Hospice and Peak Resources Outer Banks for their extraordinary and compassionate care during his final days.